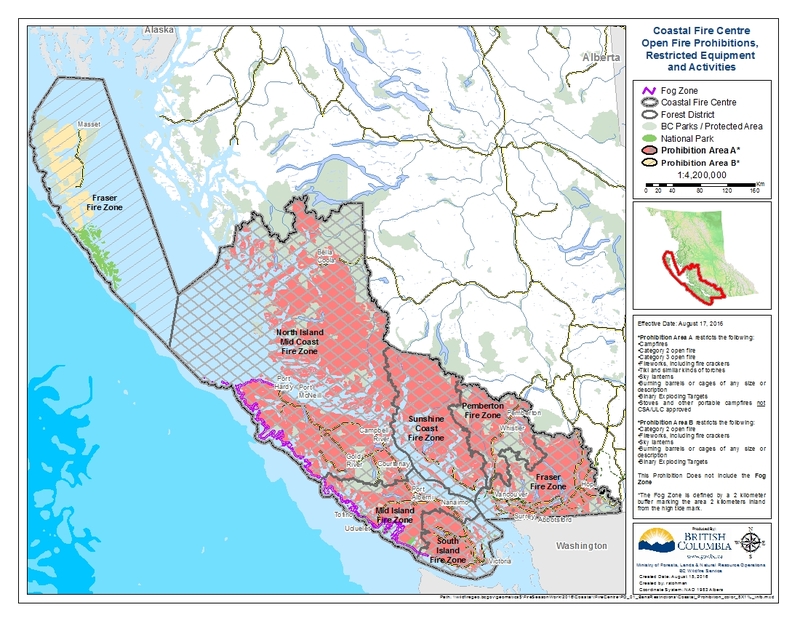 The Coastal Fire Centre has announced a Campfire Ban for most of Vancouver Island including the CVRD. All open burning, including campfires, will be banned as of noon on Wednesday, August 17. This fire prohibition is supported and applied within all CVRD electoral areas. Campfires and open burning of any size or description, including fires with a burn registration number and industrial burning. The use of fireworks, fire crackers, sky lanterns, binary exploding targets, tiki torches or burning barrels or cages of any size or description. This prohibition does not apply to CSA – rated or ULC – rated cooking stoves that use gas, propane or briquettes, or to a portable campfire apparatus that uses briquettes, liquid or gaseous fuel, as long as the height of the flame is less than 15 centimetres. The campfire ban is in effect until October 21, 2016, unless otherwise noted. To report a wildfire or unattended campfire please call *5555 on most cellular networks or toll-free to 1-800 663-5555.